The Mahlke Chronicles: Holiday Traditions: Carving Out Our Own Special Time. Holiday Traditions: Carving Out Our Own Special Time. Amid the craziness of the holiday season, we try to carve out time for our family. Christmas Eve and Christmas morning belong to our little family of four. The agenda looks pretty much the same each year. A lazy Christmas Eve spent in our jammies, an early church service crammed to the brim with my most favorite Christmas carols, dinner at our family table and then exchanging our gifts with one another. That night we shuffle the boys off to bed early in anticipation for Santa's visit--only after preparing the snacks for Santa and his reindeer, of course. Cookies and milk perched on the fireplace for the big guy and homemade reindeer grain sprinkled on the deck for the animals. 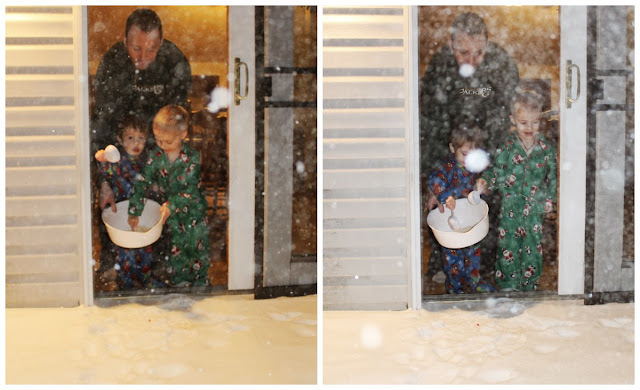 After the little ones are snug in bed, we sneak away to do our parental duties in secret--probably one of my most favorite parts of the whole thing, the experience laced with the anticipation of Christmas morning magic. Just as Christmas Eve follows a pattern each year, so does Christmas morning. Dressed in festive jammies, we descend the basement stairs to discover what Santa has left us while we slept. 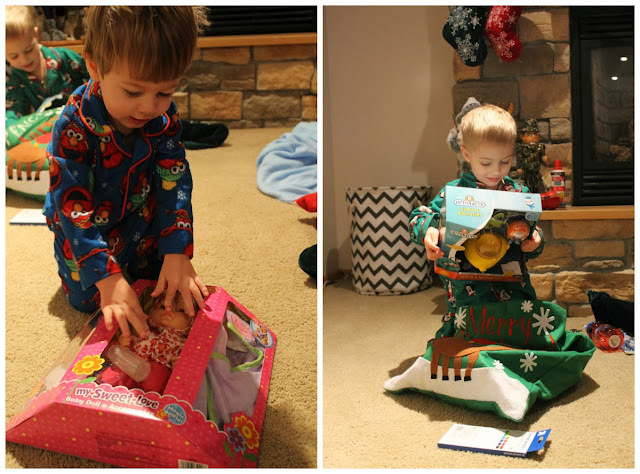 Then we tear into the gifts, oohing and ahhing and test-driving the toys. Eventually we make our wake back upstairs for semi-homemade cinnamon rolls (recipe compliments of my Grandma Faye) and so begins our Christmas day. 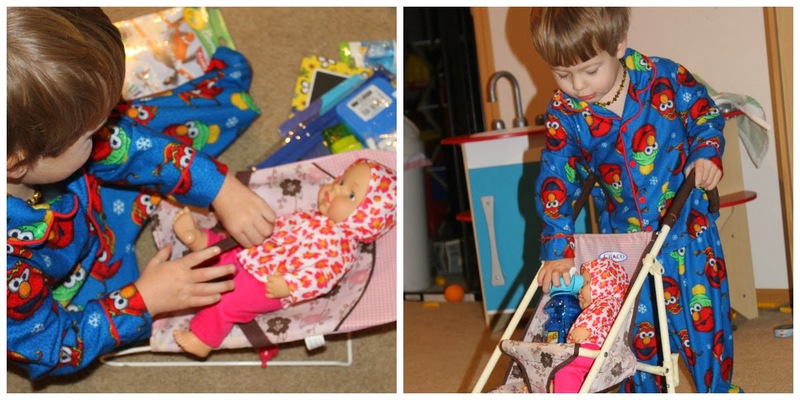 This year, on the eve of the Eve, David and I spent a great while assembling the toys shipped from Amazon. At one point it was a competition. Husband versus Wife: a Fight to the Finish. I did end up winning--after shedding my warm robe when sweat formed on my competitive-rushed body. I'm no handy-man, and the easy task of screwing in a few parts (three, to be exact) threatened to defeat me. Once the items were finally assembled and arranged in the toy room--blankets thrown over as faux-wrapping paper--we finally settled in for the night. Mimosas are most definitely a must during holiday handy-manning. 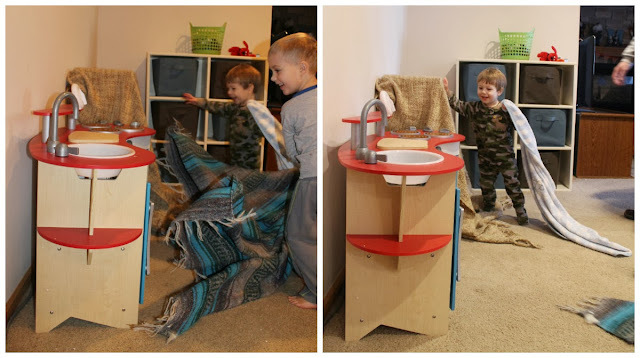 Then came the morning of the Eve, when the boys excitedly tore off the blankets to discover their new toy kitchen. They played with that thing the whole live-long day. Baking, cooking, serving customers in their restaurant, shopping at the grocery store. They tore the basement apart with their imaginary play. Eventually, the overturned table was a boat, the new kitchen long forgotten. It's moments like these--my house destroyed by the hands of my children innocently playing the day away--that make me so very aware of the beauty of childhood. Sure, I cringe at the thought of repairing the damage, but it's all worth it in the end. Christmas Eve, as we were tucking in Spencer, the day long behind us, we went around and listed our favorite parts of the day. Spencer chose playing with the new kitchen with his brother. Me? Well, that's easy. My favorite part was sitting shoulder to shoulder in the packed church belting out my Christmas favorites, every single one evoking a childhood memory so rich and wonderful. That's what Christmas is for me. Memories of holidays past spent with my loved ones, and knowing there are so many more rich and wonderful memories to be made. Very excited for his new "yankie." Custom "hunting" necklace purchased from my talented friend at the Owl Tree Boutique on etsy. Spencer asks to take it off while he sleeps because it's too special and he doesn't want to lose it. Now Daddy wants one for himself. Dumping the Reindeer Grain while the snow continues to fall. A cookie for Santa; a cookie for me. We always had big canvas "Santa bags" growing up. It's a tradition I was excited to carry over to my children. Christmas morning my alarm woke us up sharply at 6 a.m. I nudged David out of bed to plow the inches of snow off the driveway. I threw the cinnamon rolls in the oven and scampered off to shower. All tasks we wanted to complete before the boys stirred. Spencer awoke first, and we tip toed downstairs to spy the evidence of Santa's late night visit. He left a few nibbles of his cookies, which Spencer gladly finished for him. Then we retreated back upstairs to await his brother. We waited and waited. Ashton chose Christmas morning to sleep in. 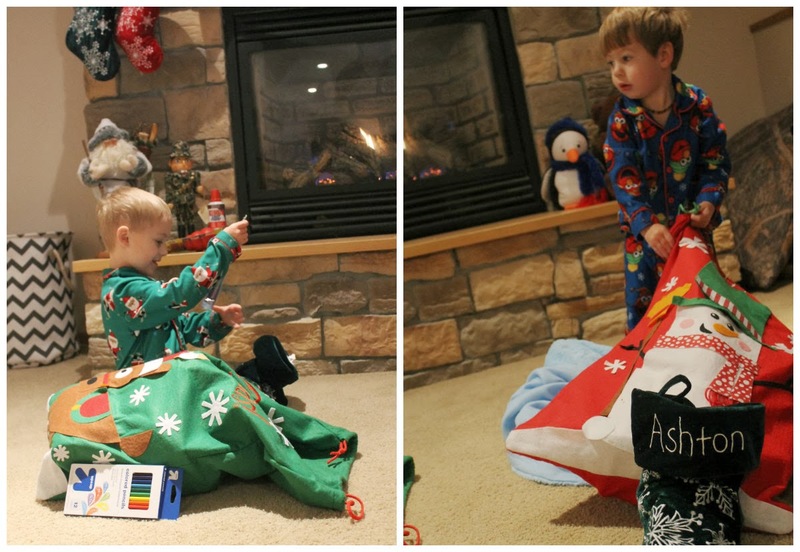 Finally, the sleeping elf awoke and we tore through the stockings and Santa bags. Already, Spencer is making a list for next year: Dear Santa, I want a helicopter like Ashton's..... Oh, and somewhere along the way, Spencer was under the impression that Rudolph is not real. Waiting patiently for little brother to awake. Our plan was to load up the truck and head to my Grandma Faye's for Christmas. But, like most years, the weather had other plans for us. Overnight, it snowed and snowed and snowed, blanketing the roads with unfavorable driving conditions. We hee'd and haw'd over the decision to cancel our plans most of the morning, until finally we decided to hunker down at home to be safe. 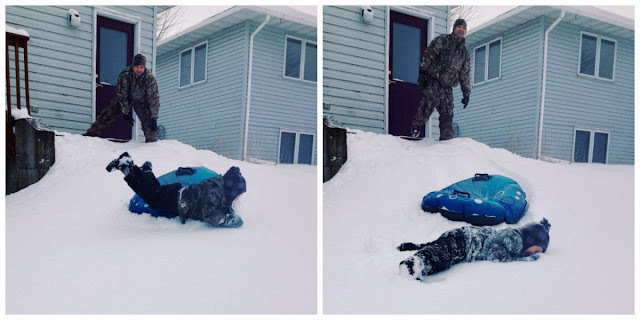 I was not thrilled with this, to say the least, but then I embraced our family day at home. Truth be told, it might very well be one of my favorite Christmases to date. 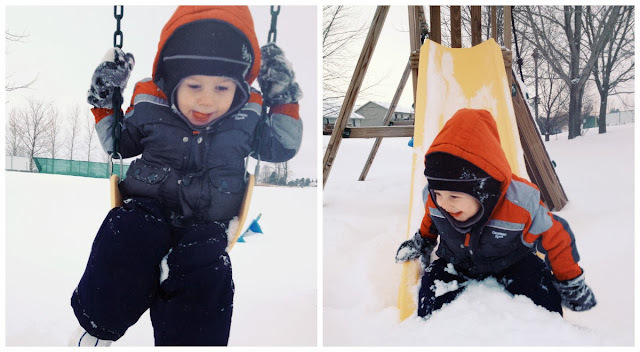 We played with the new toys and games and books, watched the new movie, and bundled up for a sledding adventure in the backyard. It wasn't exactly what I envisioned our Christmas would look like, but I loved every minute of our family jammie day at home instead. Merry Christmas!! Shoveling a path to the grill--a Mahlke staple all year 'round. Thank you so much, Dannie! You're such a sweetie! Love this post! I enjoy seeing a peek inside the Holiday Celebrations of others! Beautiful pics! Beautiful Family! Thank you so much, Dawn. I really appreciate you taking the time to comment. I also love seeing a peek inside other people's holidays! It's so fun! Love love loved this! Your hunkered down family Christmas sounds absolutely perfect! I love your sweet family, and the beautiful spirit you all have. Awww, thank you, Julia! You're the sweetest!